Presenting a selection of exceptional paintings, sculptures and works on paper, Aspects of Abstraction 1952-2007 will chart the evolution of abstraction in the second half of the 20th-century and through to the 21st-century, spanning six decades of innovation and experimentation with colour and form. Beginning with artists such as Terry Frost who channelled the landscape and atmosphere of St Ives into their work, the exhibition concludes with contemporary artists such as Sean Scully and Tony Cragg who are truly global in their outlook. Whilst the Abstract Expressionism of New York was an evident catalyst for many abstract artists of the 1960s and 1970s including William Scott, Anthony Caro, John Golding and John Hoyland, the legacy of modernist and surrealist sculptors based in Paris such as Giacometti and Brânçusi was still felt by William Turnbull and Eduardo Paolozzi. 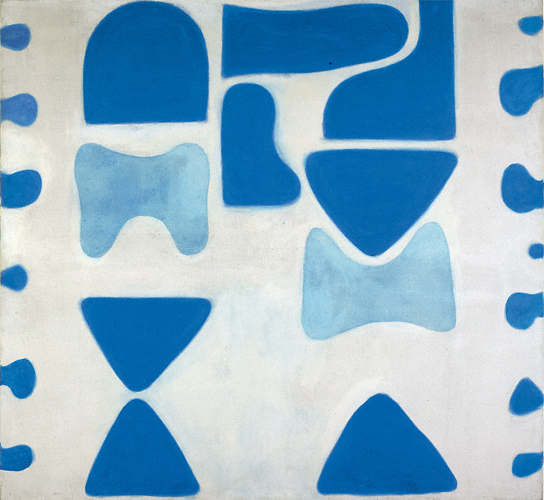 The range of work in Aspects of Abstraction 1952-2007 reveals the many guises of abstract painting and sculpture from the immediate postwar period and into the 21st-century, and the infinite variety of paths artists embarked upon to reach abstraction. Aspects of Abstraction 1952-2007 will feature works by Terry Frost, William Scott, William Turnbull, Eduardo Paolozzi, William Crozier, Anthony Caro, John Hoyland, John Golding, William Pye, Howard Hodgkin, Bridget Riley, Jack Smith, Sean Scully, and Tony Cragg. A fully-illustrated catalogue with an introduction by Margaret Garlake accompanies the exhibition.